Thatchers, Magills, Purcells, Webers [Armintrouts] and at Mrs Neills. It was nearly supper time when I got down to Wins. 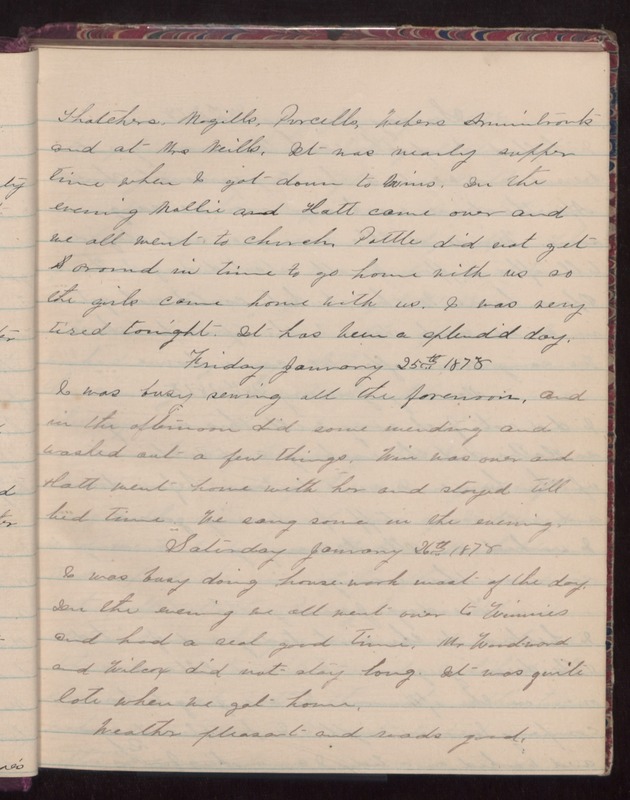 In the evening Mollie and Hatt came over and we all went to church. [Pottle?] did not get around in time to go with us so the girls came home with us. I was very tired tonight. It has been a splendid day. Friday January 25th 1878 I was busy sewing all the forenoon, and in the afternoon did some mending and washed out a few things. Win was over and Hatt went home with her and stayed till bed time. We sang some in the evening. Saturday January 26th 1878 I was busy doing housework most of the day. In the evening we all went over to Winnie's and had a real good time. Mr Woodward and Wilcox did not stay long. It was quite late when we got home. Weather pleasant and roads good.